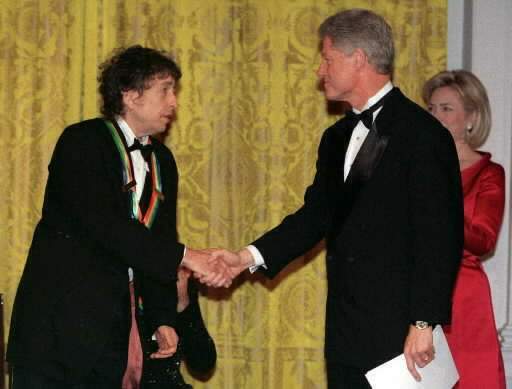 On December 7, 1997 Bob Dylan received the Kennedy Center Honors Lifetime Achievement Award, which earned him the right to wear a tuxedo and sit in a balcony with Bill and Hillary Clinton (and, more importantly, Lauren Bacall) while watching others sing his praises. The Kennedy Center Honors are a bit of a strange thing insofar as the recipients don’t give a speech and, when they’re musicians, don’t perform. They sit and nod and, in Dylan’s case, fidget an awful lot. There are cutaways to them looking on appreciatively while they are talked about, and you get to watch the president and the first lady gaze over at them appreciatively. This was the second big meet-up of the Clintons with Dylan, who, of course, also sang at Bill’s first inauguration celebration. I actually don’t know if the president is involved at all in choosing these things (I doubt it), but it is the apt culmination of the Clinton administration on its last legs, honouring the voice of the sixties, even if Dylan shed that label a long time before. Dylan was the last person to be honoured during the three hour show. The other nominees were the awesome Lauren Bacall, the horrible gun nut Charlton Heston, singer Jessye Norman, and dancer Edward Villella. Bit of a mixed bag. Dylan was introduced by Gregory Peck. That is infinitely cooler than sitting with the president, I have to think. Peck misquotes the epic “Brownsville Girl” during the introduction, but the sentiment is a good one. They then play a pretty terrible video package that, of course, focuses almost entirely on Dylan’s output in the 1960s, which is probably not what he would have wanted, but that’s what you’re going to get. The Kennedy Center, unfortunately, has not posted the other two songs to YouTube, which is sad because apparently they were both much better. There is pretty much universal acclaim for the version of “Don’t Think Twice” that David Ball produced with the backing of longtime Dylan guitarist GE Smith. Apparently there is a shot of Bill Clinton joyfully singing along to this – singing it, in fact, to Hillary. Bill, it is not a love song. Well, the Clintons have always had a different kind of relationship. The final song of the night was Shirley Caesar doing “Gotta Serve Somebody”. This isn’t on YouTube but it is on DailyMotion (which WordPress doesn’t get along with). You must click through this and watch her sing this song. Incredible. That is the way that you honour Bob Dylan – he’s the first to stand to give her a standing ovation. I hope Springsteen felt awful. 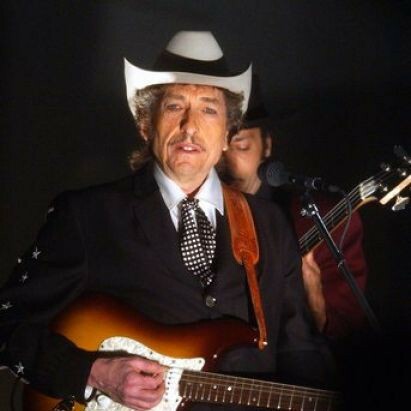 So, seventeen years ago – Bob Dylan officially proclaimed a living monument to Americana by the President of the United States. *sigh* I don’t know why it falls to me to explain some of the most elemental aspects of rock-music appreciation to you, to wit: The. Only. Lyrics. That. Mean. Anything. Are. The. Chorus. And yes, Shirley Caesar is completely awesome, as always. Thanks much for the link.